This is my favourite pasta dinner. It is delicious enough to feel like I’m indulging, but light enough to leave me feeling satisfied without being weighed down. Best of all, it comes together in about 15 minutes, providing a quick, restaurant quality meal. Great food for date night or nights when you just want to treat yourself. – 2 garlic cloves, minced. I have garlic greens in my garden and love using these as they provide a milder garlic flavour. Use these if you can source some. – 1 big bunch of basil, stems and leaves separated. – 1 cup grated parmesan cheese. Do not buy the pre-shredded stuff. Buy the highest quality you can afford as it is a key component of the dish. If you have difficulties with dairy you could try pecorino romano which is a sheep milk’s cheese and is easier to digest. Saute garlic and chopped basil stems in extra virgin olive oil over medium-low heat. If you are feeling extra naughty you can add a nice pat of butter to make the sauce extra creamy (worth it!) Once garlic begins to soften, add your tomatoes. Season the sauce with salt and pepper, to taste. Cover and let simmer over low heat while pasta finishes cooking. Once pasta is cooked, drain reserving 1 cup of the cooking liquid. Toss pasta together with sauce and parmesan cheese. Add enough reserved pasta water to make a silky sauce. You may not need the whole cup. Taste and add more salt and pepper to taste. Tear in the reserved basil leaves and combine. Serve. 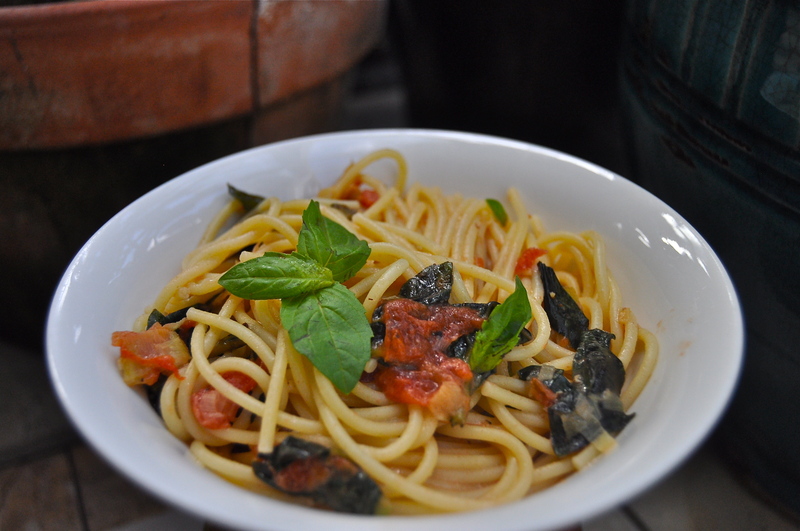 This entry was posted in main, pasta, vegetarian and tagged basil, easy, fast, healthy, pasta dinner, pasta recipe, quick, simple, tomatoes, vegetarian. Bookmark the permalink.